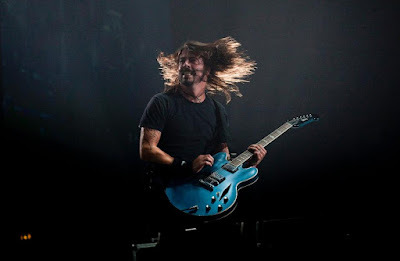 The Foo Fighters were joined by Weezer frontman Rivers Cuomo for a performance of the 1976 KISS classic, “Detroit Rock City”, during their January 30 show in Melbourne, Australia, and video from the event is streaming online. On tour across Australia together over the past few weeks, the pairing teamed up at the city’s Etihad Stadium. With Cuomo on lead vocals, the lineup delivered the legendary opening track from KISS’ fourth album, “Destroyer.” Coming on the heels of the success of 1975’s ”Alive!”, the record peaked at No. 11 on the US Billboard 200 on its way to sales of 2 million copies in the country. The Melbourne concert also saw the Foo Fighters deliver covers of classic tracks by Alice Cooper, the Ramones, Queen and AC/DC. The Foo Fighters – with guests Weezer - will wrap up their trek down under in support of “Concrete And Gold” at Mount Smart Stadium in Auckland, New Zealand on Saturday, February 3. Last weekend, the Foo Fighters’ 2017 single, “Run”, was named the winner in the Best Rock Song category at the 60th annual Grammy Awards in New York. The Foo Fighters will perform in South America later this month ahead of their return to North America in April.